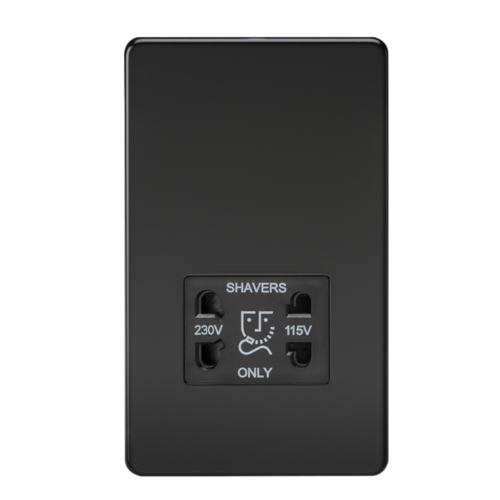 The Knightsbridge SF8900MB Matt Black Shaver Socket is the ideal decorative upgrade for use in the modern home, businesses and hotels. The screwless design features an easy clip on cover with an internal gasket for moisture protection and matching screws. It has an ultra slim profile and is constructed from durable, and high temperature resistant thermoset plastic. The slimline design will takes dual 115/230 voltage and comes with transformer and isolates the mains supply making it safe and suitable for bathroom zone 3 use. It accepts US, Australian, European and UK 2 pin plugs. Made from thermoset plastic and available with Black Socket Insert. The socket is compact in design, measuring 87.5mm wide x 148.5mm high and made to fit onto a standard 47mm 2 Gang Back box and comes with fixing screws. It complies with all relevant British Standards and CE marked and comes complete with a 15 Year manufacturers Guarantee. Some products go perfectly with this Shaver Socket: 47mm Double Pattress Box with Earth Terminal.